Since returning home to the Texas hill country a little more than a week ago, I have felt particularly welcomed by spring blooms and by the healing rain that first started on Easter Sunday and returned a couple of days later. 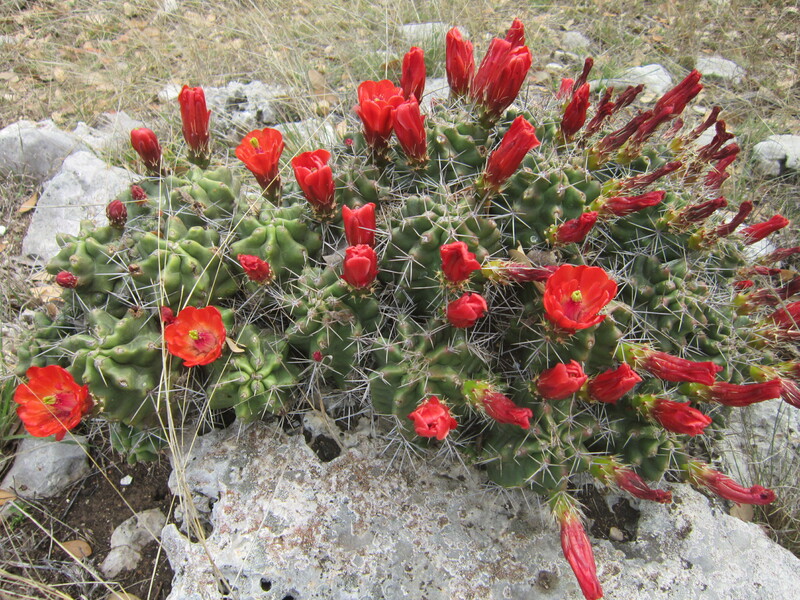 This claret cup cactus, shown above and below, startled me and my horseback riding friends in the pasture with the brightness and the number of its blooms. 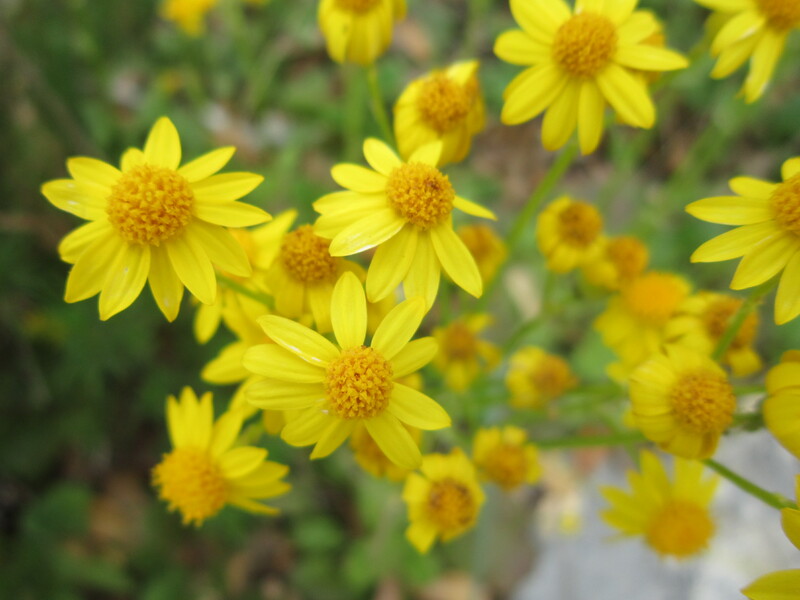 In my yard, golden groundsel lifted cheery faces skyward. 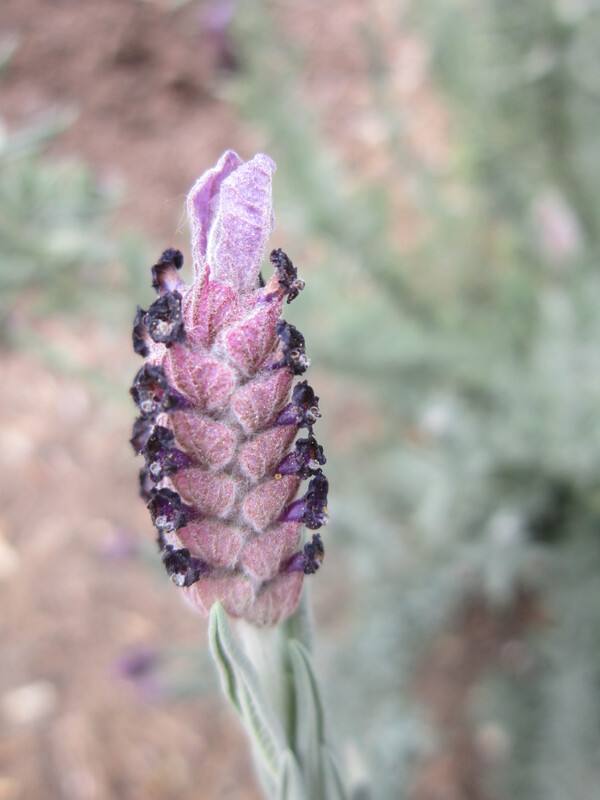 And in the herb garden, Spanish lavender bloomed for the first time since I planted it a year and a half ago, attracting honey bees. For me, as for John Burroughs, nature does indeed soothe and awaken. Sometimes I need to be quiet, to sit on the rock bench behind the house and look over the creek and listen to the birds—to stop and hear my own breathing as it flows like the shallow water below. I need the sky and a breeze and an area where I can look in some direction and see nothing man-made. Then I feel whole. And grateful. So very grateful. Sometimes I need . . . I go to nature to . . . This entry was posted in awareness, cactus, flowers, gratitude, secret glories, Texas hill country, thankfulness. Bookmark the permalink. Beautiful and so true. I love the pictures and the words. Thank you, Julie. It makes me feel so good that you’re reading my blog. And I’m excited your daughter is writing her own at http://www.waveofthedeep.com. I love your blog. It is like a meditation for me to read! I agree with Judy that you say so much and convey so much emotion (peace and beauty) with an economy of words. And, thank you for checking out Lindsey’s site. She is only 9 and I am so proud of her. She really did make it all on her own. I applaud Lindsey. The quality of her writing is impressive, and she has a good heart which shines through. Like mother, like daughter! I love it that you are writing about your family’s adventures at http://www.teaguetrek.wordpress.com. Hi, Judy! You are so kind. Doing the writing makes me feel peaceful. Spending time looking for the precious little moments in my life helps me stay more focused on what’s important. Thank you, and hugs to you and Art both. Hey Chris , I love your blog ! I have access to about two miles of the Medina river near Bandera . I try to take a walk down there as much as possible with Dexter, my dog. I love to shut out the world when I’m on my walks and concentrate on all the wonderful things nature has to offer. Maybe I learned more than English from you ! Jacques, it makes me smile to think of you walking with your dog. As one of my first (and now oldest!) students, you taught me as much as I taught you at the wise age of 22. 🙂 Being outside and noticing nature sustains me; I’m glad it does you as well. Thanks for reading! The natural world puts me back in my body where I feel safier than in my head. I calm down very deeply. That rain Easter was so primal…thunder, lighting, pouring rivers of life giving water. I felt my dry soul sucking it in with heartfelt gratitude. When it rains, I like to pull a chair up to the window and just watch. I like your description of it as primal. Thank you, as always, dear friend Linda. Sue, I was thinking of you today and planned to post a photo for you on FB. I’m so glad you found these bouquets here on the blog. Each petal represents a wish for your wellness and joy. Blessings to you! Win the day. Chris, what beautiful pictures! The claret cup cactus is spectacular. How right you are that discovering one while horseback riding is like a right-of-spring moment here on the ranch. Perhaps you remember how Lydia would take her fellow riders around to where she knew the clarets might be blooming, just to admire each for its insistance on ‘standing out’ amidst the grey of the rocks and no-yet-green grass. Florence, thank you for reading and for your lovely description of the clarets! Lydia was a kind friend, wonderful neighbor, and a mentor in many ways. I remember, in particular, her showing me a possumhaw tree with its brilliant red berries. 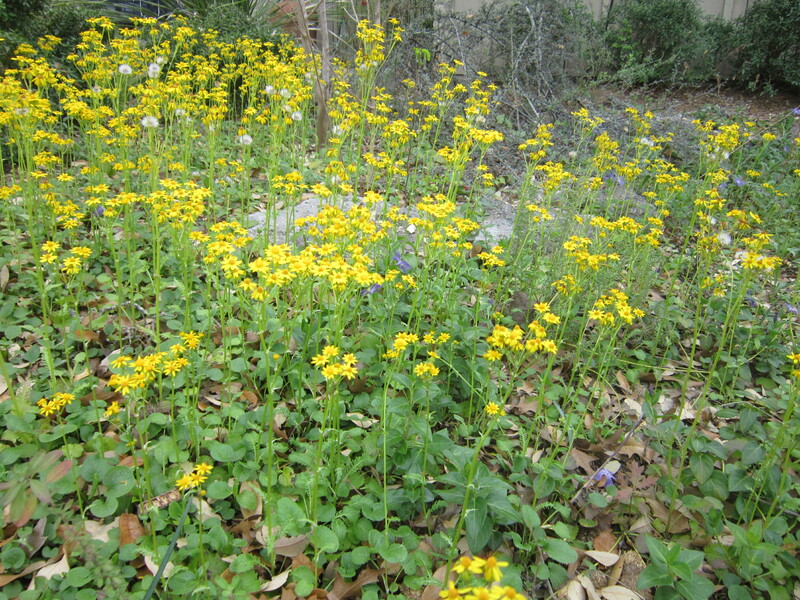 At that time, I had never heard of that native plant. Now I have one in my yard and think of her when I see it. Wishing you blessings.